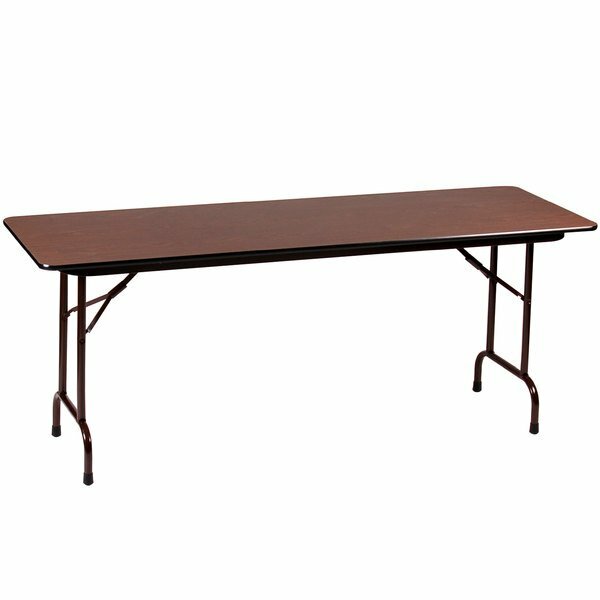 This Correll CF2448M 24" x 48" walnut finish folding table features a durable melamine top on a 5/8" high density particle board core. To accent your table's sophisticated design, a brown frame and black t-mold complement the smooth walnut finish top for a look that effortlessly blends with any decor. Two 1", 18 gauge steel pedestal legs on mar-proof plastic foot caps provide superior stability when in use, while a 1 5/8", one-piece steel apron reinforces the CF2448M's unbeatable strength. Each table easily folds for transporting and storing. When ready for use, the legs simply lock back into place with an automatic lock-open mechanism. Two people can comfortably sit at this table. This is a very nice and simple table! Good for quick and easy set up! Nice discounted price! Very sturdy! Good for setting up a display too!